These worksheets are exclusively designed to help students in grade 1 and grade 2 learn subtraction in a more fun way! 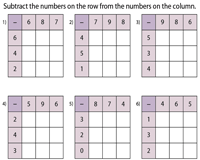 This extensive collection of highly interactive subtraction squares worksheets is organized in the following grid sizes: 2x2, 3x3, 5x5 and 10x10. They are further split into two levels, easy and moderate. A number of free printable worksheets are available for practice. 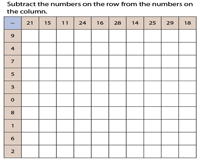 Use the 2x2 grid squares to subtract the numbers displayed in the column from the numbers in the row. Write the answers in the appropriate squares. Utilize the answer keys to check your responses. 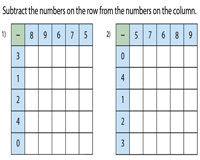 These worksheets feature 3x3 subtraction squares. Easy level contains single-digit numbers. Moderate level has two-digit numbers. 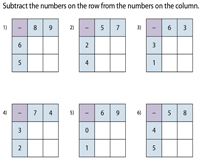 Get young learners to find the difference between the numbers arranged column-wise and row-wise in this set of 5x5 subtraction squares. Download this series of fascinating large grid worksheets (10 by 10) to provide students with abundant practice on subtraction.